I have to smile as I look at the title of this piece, and it is because of the Wine Lover’s Calendar. There is this state that abuts Michigan and there have been rivalries since the days when the area was still a territory. There was even a skirmish over a small strip of land from Toledo west bound that became part of Ohio, while Michigan received the Upper Peninsula out of the deal. There is another rivalry between a couple of universities of higher education, and since I did not attend any of them, I have always watched that rivalry with a grin, though there is a rumor that there is a misguided Wine Blogger that hails from Michigan, but for some odd reason roots for the other side, but that is irrelevant to all of this. All I know for certain is that I never exceed the speed limit when I am driving in Ohio, as my license plate is a magnet for potential tickets. I also wrote once about the only restaurant in Ohio where the name of the establishment is M and it is in Columbus, Ohio and it was a wonderful experience. To talk about an unspoken rivalry I guess, just for kicks today I visited a couple of good size wine shops to look at what was being offered. I saw wines from Michigan, California, France, Italy, Germany, Portugal, Australia, New Zealand, Hungary and a couple of countries from South America. There was not a single wine on the shelves from Ohio, and perhaps this holds true in reverse in Ohio about Michigan wines. It really is a shame, since I have now had a chance to try some wines from Ohio on one of our trips and we enjoyed them enough to buy a couple of mixed cases. I also went and looked at my early wine scrap book to see if I had a label from Ohio; lo and behold I did have one. 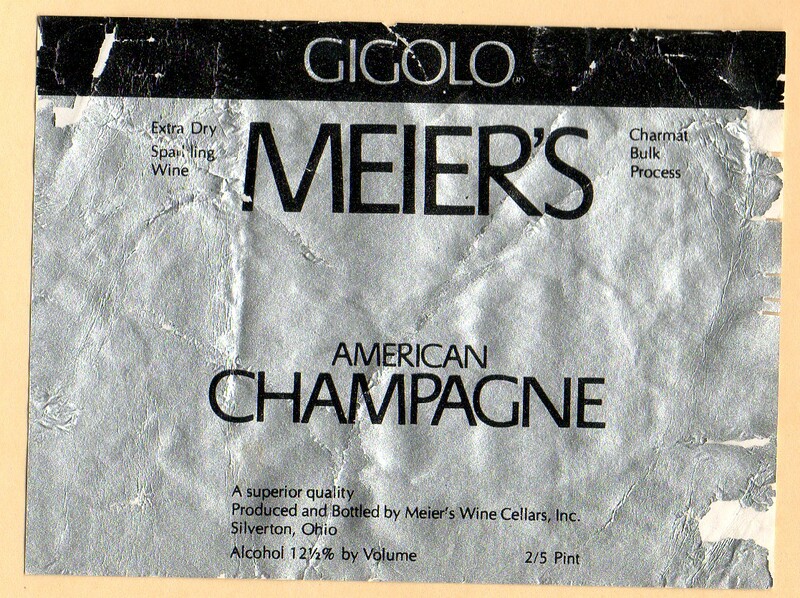 I once had at least a bottle back in the ‘60’s or ‘70’s of Meier’s Gigolo Extra Dry American Champagne NV. This wine was done in the Charmat Bulk Process, but I cannot attest to the varietals used, but I did some research on the winery. 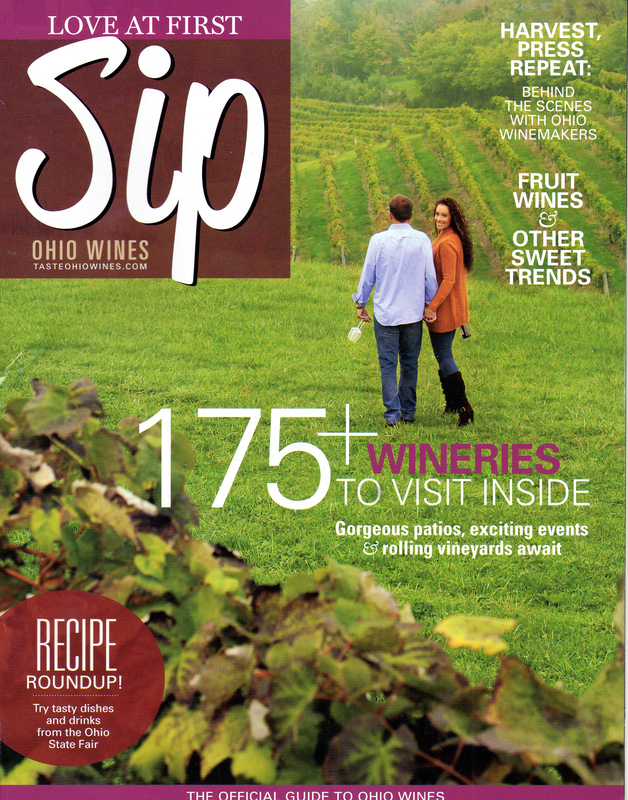 Meier’s Wine Cellars, Inc. is the oldest winery in Ohio and they started out in the juice business back in the 1880’s and they are located in Silverton, Ohio which is just outside of Cincinnati. They survived the Prohibition Era when they went back to just juice and they now offer over forty assorted wines and twenty-one assorted still and sparkling juices. From their website I surmise that they use mainly the Cold-Hardy varietals that are found in New York and in Michigan as well. I also enjoyed looking at a side posting of theirs that show some of the old wine labels that they have in their archives. The Gigolo label is shown, but it is much different from the label that I have, and I think that I one of the few that get excited at looking at different wine labels. So this month I shall make it a point to perhaps finish off the Ohio wines that I have in my own cellar. This entry was posted in Wine and tagged American Champagne, Charmat Process, Cold Hardy, Gigolo, Meier's Wine Cellars, Ohio. Bookmark the permalink.